12A7462 MICR - Lexmark T630 MICR Toner, Lexmark T632 MICR Toner - This T630 MICR toner is a compatible 12A7362, 12A7462 MICR toner. 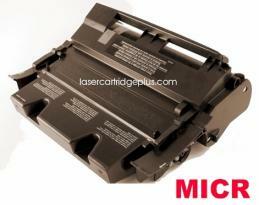 This T630 MICR cartridge is also compatible with 12A7460, 12A7360 toner. Print Technology: MICR, for printing checks. For use in Lexmark T630, T630dn, T630n, T632, T632dtnf, T632n, T632tn, T634, T634dtn, T634dtnf, T634n, T634tn, X630 MFP, X632 MFP, X632e MFP, X632s MFP, X634dte MFP, X634e MFP. Replaces Part Numbers 12A7462 MICR, 12A7460 MICR, 12A7362 MICR, 56P2542 MICR, 12A7360 MICR, 12A7468 MICR, 12A7468 MICR, 12A9685 MICR, 24B1439 MICR, MICR-TLN-630, MICR-TLN-760.